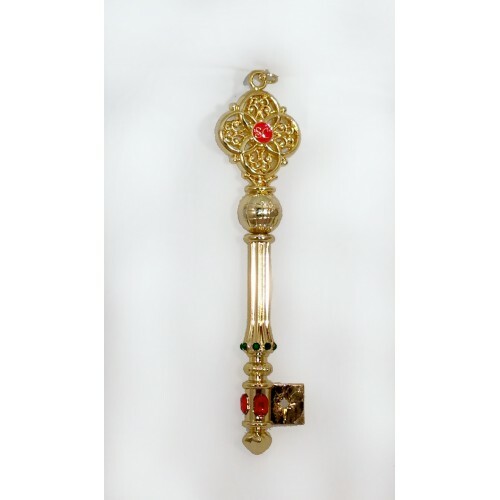 Here is Santa's Global Key, called by many Santa Clauses "one of the most beautiful keys ever, yet a tremendous value". 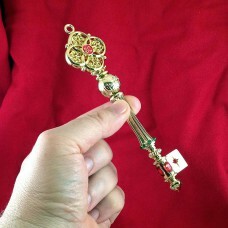 While you can hang this on a tree or use about the house for a seasonal decoration, this key was designed to be a true Santa prop to enhance your portrayals. 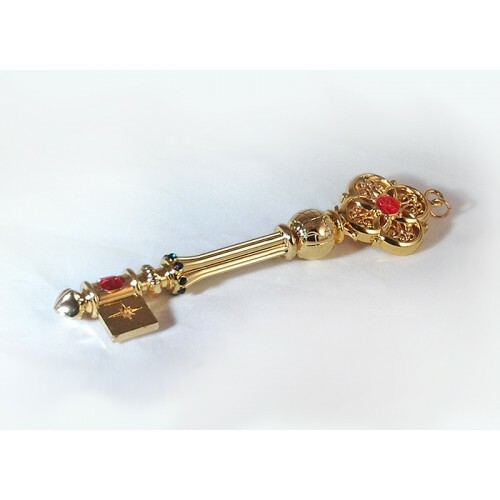 No lightweight, the key is manufactured in solid metals (zinc alloys), elegantly gold-plated in an 18k finish and trimmed with eleven jewels to catch the light. 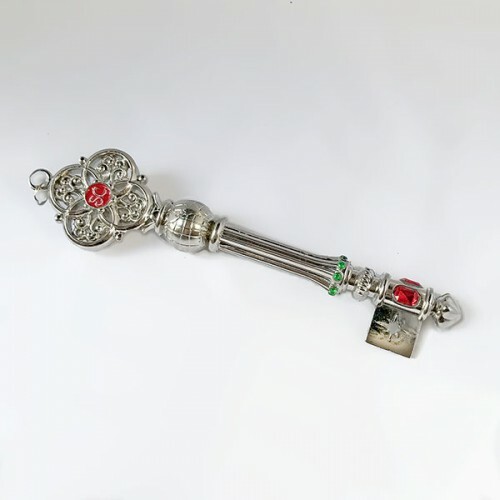 The key is also available in a bright, rhodium finish (silver color). We used faceted stones that closely resemble real emeralds and rubies. The key is approximately 6-inches tall and weighs about 4 ounces – very substantial. 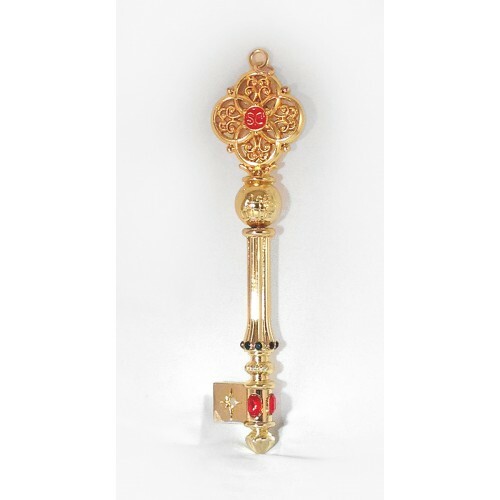 We designed this key to bring wonder to the minds of every child who sees it hanging from your belt. It has a globe to signify Santa's worldly travels and an enamel and gold SC to hint at whose key it might be without screaming "SANTA". The center shaft is delicately fluted, terminating in the emerald-like stones. The tenon includes a Christmas Star cutout. And, we have produced a fine black leather key keeper with a gold-plated hook to coordinate. 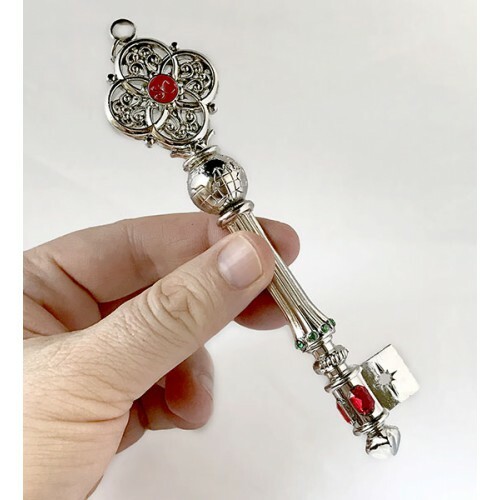 Consider what one experienced and avid Santa Key Collector (Wayne McManus) has said, "there are few (if any) keys that are currently in production and even fewer that are of the right size, materials, and quality to use as a prop by Santas. There really isn't much available in terms of that market. 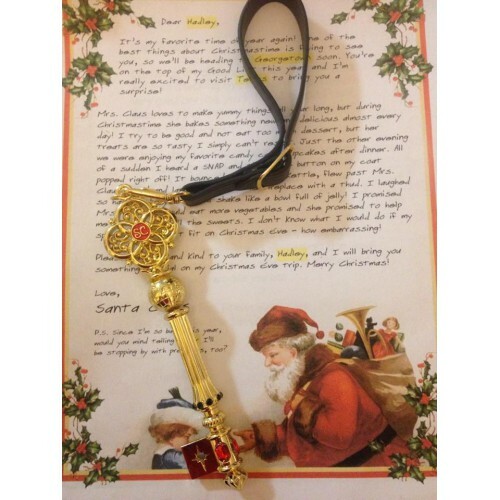 This key will add to any Santa portrayal and not be merely a decoration to display at Christmas time at home." This key was a work-in-progress for over a year (my wife says I'm too picky). We are confident you will love yours.